A woodstove is an excellent way to supplement your home’s winter heating. However it is important to operate and maintain it properly. Part of maintaining a wood stove includes regular cleaning of the chimney and stovepipe as high levels of soot and creosote build up could otherwise lead to a chimney fire. The “How to Clean a Wood Stove Pipe Ebook” will show you how to properly disassemble, clean and reassemble your woodstove stove pipe. It provides detailed instructions and pictures in every step of the process! Order Now and Immediately Download the Installation EBook today! 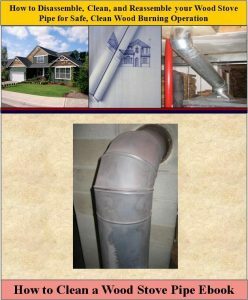 The How to Clean a Wood Stove Pipe EBook costs only $9.95 and is 100% guaranteed. Protect your House from a Chimney Fire Today!! Protect your Home From Fire due to an Unclean Wood Stove Pipe Today!! About the Author: Besides a 40 year career in the aviation industry, an adjunct college instructor, and the builder of a number of homes, Les Donovan is also an author of short stories and other home improvement articles and Ebooks. His most recent short story titled “The Hermit and the Woodchuck ” was recently published by Publish America and is available on Amazon.com.